Yanga VS Thato - who will grab the title. 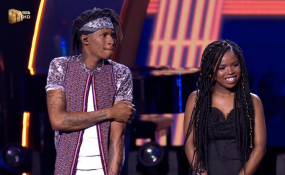 Mzansi kisses Thando goodbye as Yanga and Thato sprint to the finish line of Idols Season 14! The road to the SA Idols final may have come to an end for Thando, but tonight’s live show was more of a celebration than a sad farewell. The Top 10 made a surprise return to the stage to memorialise the record-breaking 110 million votes garnered over the season so far, with nearly 22 million of those coming in over the past week as Mzansi fans fought to keep their favourites in the competition. Small in stature and big in voice, Alberton’s pride leaves Idols with a bagful of memories and an amazing experience including a Dubai trip and a newly-recorded single called Wasting Time, which she performed live and is already available on most digital platforms. Yanga and Thato, who Mzansi chose as their finalists for Season 14, also debuted their first-ever singles tonight. Thato’s single, Blow By Blow, is an up-tempo breakup tune where he seeks to understand what happened to the love. Somizi didn’t think the song suited him but agreed with the other judges that his energy and performance keep drawing people in and make him one of the most likeable contestants on the show. Their second performance was preceded by lively entertainment courtesy of the vibrant Tsonga rap princess Sho Madjozi, performing her hit Huku. When the finalists came back for the Theatre Week song, they blessed Mzansi with even more beautiful music. Yanga sang Heaven by Emeli Sande, and Thato’s song was Sam Smith’s I’m Not The Only One. Tonight, the Idols certainly pushed boundaries as they sang three songs each. Their last performance was Song Of The Season, which they felt was their best. Yanga went with Try Sleeping With A Broken Heart by Alicia Keys. Thato chose If by Davido, closing off the last ever voting show of the season. Now it’s up to Mzansi to take their favourite over the finish line. Next week promises to be one of the best live finals ever seen on Mzansi television; it’s gonna be LIT!! !